Up until the 1980’s movie posters and other advertising materials were printed in very limited quantities. Different sizes were offered depending on the needs of the studio or theatres. Movie posters were, in general, not meant to be saved. Most forms arrived at the theatre folded from the studio supplier. 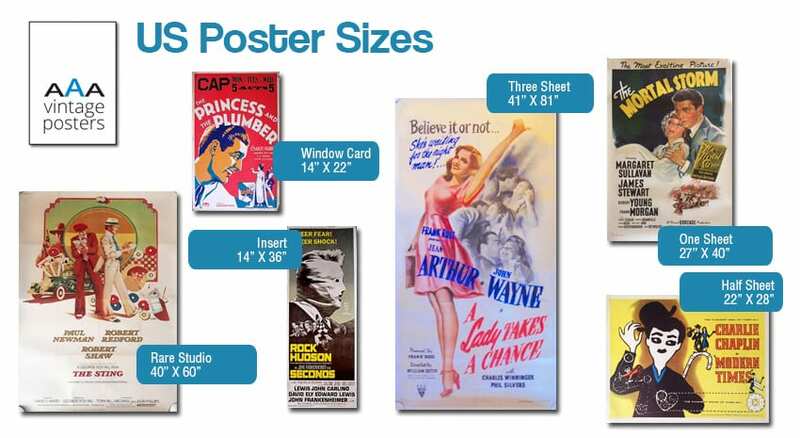 The following are the different sizes and styles of American movie posters. For Non U.S. poster styles and sizes click here. The most common and MOST COLLECTIBLE type of American movie poster. Nearly all one sheets printed before 1985 measure a full 27″ x 41″. Most recent one sheets are approximately 27″ x 40″. Please be aware that sizes can vary quite a bit sometimes and that posters do not have to measure EXACTLY 27″ x 40″ or EXACTLY 27″ x 41″. One sheets are always in a vertical format. Up until the early 1980’s, most were issued folded with one vertical and three horizontal creases. Some were issued tri-folded. One sheets are still used in theaters today and now always issued rolled. This is what most people consider the standard U.S. poster. A vertical format American movie poster, measuring 14″ x 36″, generally issued on thicker stock paper. Their smaller size makes them popular with collectors. Inserts from the 60’s and before were often issued folded. Generally much rarer than a one sheet. Studios stopped issuing these in the early 1980’s. A horizontal format American movie poster, measuring 22″ x 28″, generally on thicker stock paper. Newer ones were issued rolled, older ones were issued rolled and folded (folded twice which is not considered a defect). Usually VERY RARE compared to a one sheet or insert. Studios stopped issuing these in the early 1980’s. These are extremely rare compared to a one sheet. A vertical format American movie poster measuring 30″ x 40″ printed on heavy card stock material. Most 30×40’s feature the same artwork as the one sheet and were issued rolled to the theatre exchanges. The National Screen Service number is sometimes found on the side on the poster, as opposed to the lower bottom as is the case with one sheets. These are VERY difficult to find in Near Mint condition because the card stock can crease easily. The print run for most 30×40’s was usually just a few hundred, making them much rarer than 27″ x 41″ paper one sheets. These are extremely rare compared to a one sheet. A vertical format American movie poster measuring 40″ x 60″ printed on heavy card stock material. Most 40×60’s feature the same artwork as the one sheet and were issued rolled. They were primarily offered for major motion pictures only and were displayed both inside and outside of theatres. Only a few hundred of these were printed, and it was usually only printed once. In contrast, the one sheet was usually printed in quantities of 10,000 and up. The NSS number is sometimes found on the side on the poster, as opposed to the lower bottom as is the case with one-sheets. VERY difficult to find in Near Mint condition because the card stock can crease easily. Studios have stopped issuing these. An extremely popular and very rare HORIZONTAL format American movie poster measuring approx. 41″ x 54″ or 45″ x 60″. Subway sheets are printed on a thicker paper than one-sheets. Most contain the same artwork as the advance materials, and are almost always issued as “advances.” They are most often found in subway displays. These posters can be either rolled or folded. Some collectors like the subway sheet because there are fewer of them released. Because they are printed on a thick paper, they can be more durable than one sheets. Still used today and are roughly twice the size of a one sheet. A very rare American movie poster measuring approx. 30″ x 45″. They look like a very large ONE SHEET. They are printed on a thicker paper than one-sheets. Most contain the same artwork as the advance materials, and are almost always issued as “advances.” They are most often found in subway displays. These posters can be either rolled or folded. Some collectors like them because there are fewer of them released. These are rare compared to a one sheet. They are a very large and VERY DESIRABLE vertical format American movie poster measuring approx. 41″ x 81″, they were almost always issued folded. Originally designed to be pasted on small billboards. Studios stopped issuing these in the late 1970’s. Being roughly three times the size of a one sheet they were usually printed in two or more sections that are assembled together for display. These sheets can be quite striking and can have actual life size images. A HUGE billboard sized movie poster measuring approximately 9 ft. x 20 ft., roughly 24 times the size of a one sheet. Produced in 12 or more overlapping sections. Almost always folded. EXTREMELY RARE. Designed to be pasted on billboards or the sides of buildings. Studios still use these today. This vertical format American movie or advertisement poster usually measures 45″ x 70″. It is designed for display in glass-enclosed corner bus stop shelters. They normally feature very colorful, eye-catching and different artwork and are printed on a coated card stock or vinyl like paper. Many of them are double-sided, and come in a series. Movie studios frequently use them for major productions. Banners come in a variety of sizes. Older ones usually came in a standard size 24″ x 82″ or 24″ x 60″. Newer ones come in all different sizes, usually very large 3’ to 4’ in width to 8’ to 12’ in length, either horizontally or vertically. Banners can be released as advances or regular issues. Their artwork can vary from simplistic to extremely detailed. Although banners occupy a large amount of display space, they are still considered very collectible to movie art collectors. Banners are printed in limited numbers which makes them harder to obtain than other more common sizes. A vertical format poster, measuring 14″ x 22″, on thicker stock paper with a blank area usually at the top for writing in the venue and play dates. Most window cards are unfolded, but some older ones might be folded. Since this is how the posters were intended to be used, this is not considered damage by most collectors. Other cards may have had this top portion trimmed off. This trimming does lower the value of the poster but can be easily restored. A vertical format poster, measures 8″ x 14″ and is on thicker stock paper. These are extremely rare and highly collectible. Some older cards indicated as used may have a theater name and play date hand lettered on the blank white area at the top of the poster. Since this is how the posters were intended to be used, this is not considered damage by most collectors. Other cards may have had this top portion trimmed off. This trimming does lower the value of the poster but can be easily restored. Lobby cards are no longer used in theaters and are rarely printed for today’s films. These small posters on card stock (usually 11″ x 14″ in a horizontal format) were generally produced in sets of eight, intended for display in a theater’s foyer or lobby. A lobby set typically consists of one Title Card of special design usually depicting art or key stars, listing credits and intended to represent the entire film rather than a single scene; and seven Scene Cards with each depicting a scene from the movie. Some studios did not issue title cards and all 8 cards are scene cardsThere are also Mini Lobby Cards measuring 8 1/2″ x 10″ (stills). Measure 8″ x 10″. Issued in sets of varying numbers. Sometimes on photo paper, sometimes on card stock similar to lobby cards. They are sometimes referred to as Mini Lobby Cards. These usually measure 20″ x 60″. They are rarely used today and are highly collectible and very rare. They are printed on both card and paper stock and are issued for major productions or special theater runs. They were either issued alone or in a set of posters (usually a set of four). They usually contained their own unique artwork, normally featuring characters. They were primarily used for display on theater entrance doors. These are small and sizes vary from 11″ x 17″, 13″ x 20″ and other sizes. These are giveaways from the theater if you attend the movie. Usually they have very little value although sometimes they can be quite collectible.